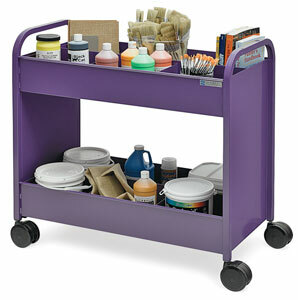 This rugged welded steel cart is designed to hold books, supplies, student work, and storage bins, among other things. It moves easily on quiet dual-wheel casters. Used in place of costly fixed storage areas, class projects can be rolled to the work area. ™ Smith System is a trademark.™ Everything Cart is a trademark. ® Greenguard is a registered trademark.